What is an Utah Promissory Note? Utah Promissory Note: What Is It? A Utah promissory note is a written contract between a lender and a borrower. The borrower receives a loan from the lender and promises to repay it according to the terms specified within the promissory note. Utah promissory notes, when properly drafted and executed, are legally binding documents. Utah promissory notes may be secured or unsecured. When a promissory note is secured, the lender has the legal right to collect a specified piece of collateral if the borrower does not comply with the agreement. An unsecured promissory note is basically a signature loan. The borrower promises to repay the loan by signing the note. If they don’t pay it, the lender does not have the legal right to retrieve collateral. What Is the Maximum Amount of Interest That May Be Charged in Utah? In Utah, the maximum interest rate depends on whether the repayment agreement is in writing. If it is, such as with a promissory note, and the written document addresses interest, the parties may agree to any interest rate. If there is not a written agreement or if interest is not addressed, the maximum amount of interest that may be charged in Utah is 10% per year. The state statute sets out some exceptions to this. The date the Utah promissory note was created. This date is placed beneath the title of the note. The most common format for this date is the month, day, and year. Another important date is the date of the signature to execute the agreement. This date, as well as the date the note was created, help show that the borrower entered into an agreement to repay a loan. It also helps to set certain legal deadlines. The name of each party and their role in the agreement. To identify the parties, use their legal name. After the legal name, list the role this person or entity holds within the agreement. This includes lenders, borrowers, and co-signers. The mailing address for each named party. It is important to remember to list the city or town, state, and zip code for each mailing address. If the promissory note is secured, list the physical address for the borrower (and any co-signer) if it is different from their mailing address. Lenders often have more than one mailing address. This section lists the general mailing address. If there is a separate payment processing address, it should be documented in the payment agreement. The principal amount of the loan. This is the amount loaned to the borrower without the interest charged. Before a Utah promissory note is executed, make sure this number is accurate. The interest rate charged per year. This is the amount of interest charged each year on the loan. It is expressed as per annum or annual percentage rate (APR). In Utah, the parties may agree to any interest rate as long as that rate is in writing. Payment agreement. 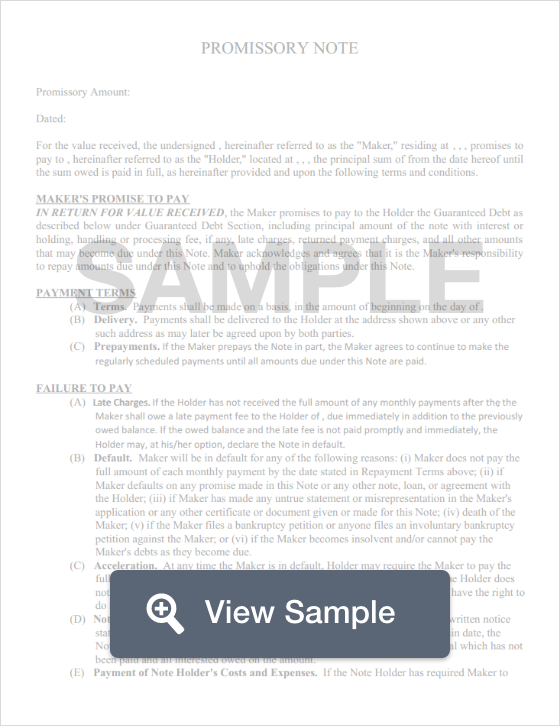 This section explains the total number of payments that must be made, the due date for each payment, and the amount of each payment. The late fee amount should be listed as well as when it is assessed. The payment processing address should be listed in this section, too. For secured Utah promissory notes, include a section that provides an accurate description of the collateral. Failure to include a description of the collateral may result in the note being treated by the court as unsecured. Interest Due In the Event of Default. This interest rate is what the borrower will pay if they default on the agreement. Payment Allocation. This clause documents how the payments received are split between the principal loan and the interest. Acceleration. An explanation of the lender’s legal right to demand immediate payment of the remaining amount owed if the borrower does not comply with the terms of the loan. Prepayment. An explanation of whether the borrower will pay a financial penalty for paying off the loan early. Attorney Fees and Costs. A clause that explains how any attorney fees and costs incurred by one or both parties to the agreement will be handled if the fees and costs relate to the Utah promissory note in some way. Waiver of Presentments. A clause that states the lender isn’t required to be physically present at the time payments are made. Severability. A way to protect the remainder of the promissory note if one portion of it is found to be invalid. Conflicting Terms. A clause that documents how any conflicting terms will be clarified. Notice. An explanation as to whether the lender will notify the borrower if they plan to sue for default. Governing Law. A clause that documents the name of the state whose laws will be followed if an agreement arises over the Utah promissory note. There is no legal requirement to have a Utah promissory note notarized. To execute the note, the borrower and any co-signer to the loan must sign and date the agreement.